D.G. Martin signs copies of his new book at Park Road Books on Oct. 12 and Main Street Books on Oct. 13. Oct. 12, 7 p.m. Park Road Books, 4139 Park Road. 704-525-9239. parkroadbooks.com. 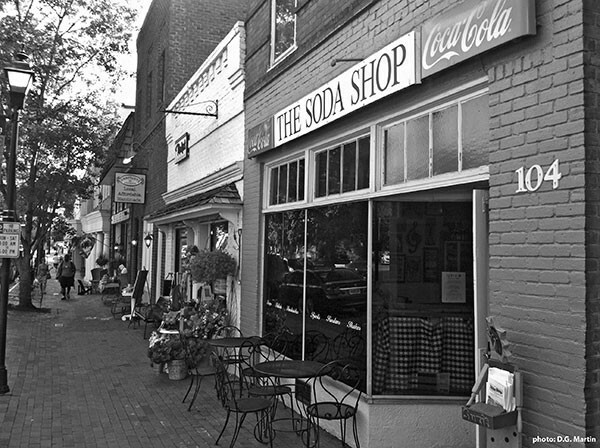 Oct. 13, 6 p.m. Main Street Books, 126 S. Main St., Davidson. 704-892-6841. mainstreetbooksdavidson.com. When D.G. Martin ran for Congress, once in 1984 and then again in 1986, the Charlotte district covered Mecklenburg, Iredell and Lincoln Counties, as well as some of Yadkin. It had been held by Republicans for decades, and the Democratic Martin had some good campaigns, he recalls, only losing the first time by 300-odd votes. It was a good race, and the candidate covered the sizable district one greasy spoon at a time. "What I found out is if you're going to go to Lincolnton, you go to where the locals eat for your campaign event — same thing in Statesville and in Yadkin County," Martin says. "I loved that aspect of meeting with a few people (and) having conversations that might challenge your views, but they were by and large friendly people." He may not have landed the congressional seat, but the Mecklenburg County native was reminded of something he'd experienced his whole life: if you want to find out about the people who live someplace, you go to the local restaurants. Many of them have been in the same family for generations and have become institutions in their own right. 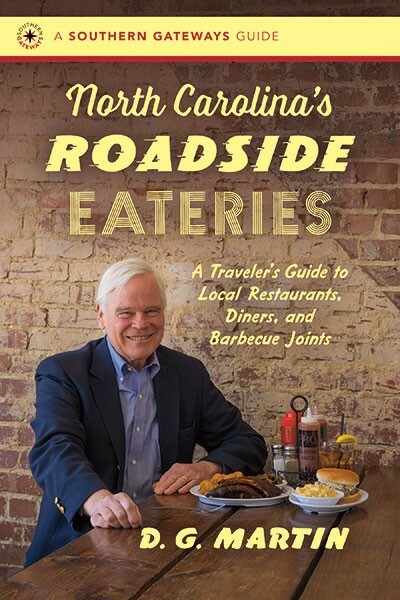 In his new book North Carolina's Roadside Eateries: A Traveler's Guide to Local Restaurants, Diners, and Barbecue Joints, he presents 100 such locations. There are burger and seafood joints, Mexican and Mediterranean restaurants, and certainly down-home Southern diners. On Oct. 12, Martin speaks at Park Road Books in support of this guidebook. In a way, the author — also a newspaper columnist and the host of UNC-TV's North Carolina Bookwatch — is coming home; he grew up in north Mecklenburg and practiced law in Charlotte as a young adult. North Carolina's Roadside Eateries, however, is largely designed with curious travelers in mind. "On these roads, particularly on interstates, we get on and generally don't stop except for at an intersection for a quick bite to eat," Martin says. Rather than seek out the same chain you can find anywhere, he proposes, why not seek the place where the locals go? "It turns a long, boring trip into something that's refreshing and adds to the spice of life." For the restaurants in North Carolina's Roadside Eateries, Martin's rubric is simple: they must be inexpensive, family-owned gathering spots that are convenient to an interstate. It's not a foodie book, though gourmet types would be wise to seek livermush at the Shelby Cafe, he volunteers. These are places to get reliable country cooking. Maybe the foodie guide to the interstate can come next, he offers with a laugh. It wasn't altogether easy to choose what went in the book, either. There are plenty of good places to eat, Martin explains, but many are either franchises or too expensive or too new to have proven themselves yet as local gathering spots. Some eateries Martin wanted to include are simply no longer there. "One of my longtime favorites was a place called McDonald's Cafeteria, which was an African-American-owned, wonderful, wonderful gathering place right off the Beatties Ford Road / I-85 intersection," Martin says. "It was the perfect place, and five or ten years ago Mr. McDonald passed away and it went out of business." The author knows, too, that his Charlotte friends will ask why he left out this or that beloved local restaurant. This is a positive criticism, Martin says. He welcomes these suggestions, and he's taking notes for the next edition. For transplants, though, he feels this book can help them get to know the state. "It will be fun even for outsiders who never hope to take these trips to read them and get a little taste of what North Carolina is like," Martin says. "Even for places in Charlotte they've heard about and never gone to, like the Open Kitchen, Lupie's — these are local places where local people have been going for a long time." With certain Charlotte area spots, Martin was one of those locals. The Acropolis Cafe and Grill in Cornelius, where North Mecklenburg's class of '58 — Martin's high school class — holds its reunions, is only three or four miles from where the author grew up. Charlotte's Open Kitchen is one of the few places that has held on for Martin's entire life, and it gets an extra-long entry in North Carolina's Roadside Eateries. In 1959, Davidson's basketball team was having a lousy season. On New Year's Eve, following a particularly humiliating loss, Martin and the rest of the team showed up at the Open Kitchen, where the crowd cheered them up. "If you live in Charlotte and you haven't been to the Open Kitchen — I'm out there telling travelers that they should stop there!" Martin says. "It's a nice place to eat, but it puts you in touch with 60-odd years of Charlotte history, a place that people who lived and died in Charlotte long before you moved there have been." At the root of Martin's love of the junction of country food and gathering places may be the Mallard Creek Barbecue. He heard about it in high school from his friend Tommy Oehler, whose family runs the annual event (this year it falls on October 27). He didn't go as a teen, Martin admits, but developed his love of the Mallard Creek Barbecue a decade later when he was practicing law in Charlotte. The food is great, sure, but it's the opportunity to meet people that's the real draw. What Martin presents in North Carolina's Roadside Eateries is something he's valued for decades, and he pauses while talking about Mallard Creek to make a mental note. "I've gotta get it on my calendar for this year," he says.